Born in Seaforth, Ontario, Canada, January 11th 1940 to his Lithuanian mother, Mary Florence, and Polish father, Manny, David Burk grew up in a strict Kosher, and modest household in Windsor across the river from Detroit with his brother, Joe, and sister, Gail, often working weekends at his father’s Dry Goods general store. Winning a four-year scholarship to medical school, he completed his training from the University of Western Ontario and internship at Toronto General before taking up Psychiatry Residency in Montreal General 1964-65, and Cincinnati until 1968 where he married a fellow Child Psychiatrist, Gloria Sachs. When the tires of his car froze to the parking lot on his day off, he and Gloria fled to California. At Stanford university School of Medicine, he took up a Postdoctoral fellowship before working there as Assistant Professor of Psychiatry 1970-73. Director of the Peninsular School, Palo Alto school for autistic and schizophrenic children and adolescents till 1974, Medical Director of Inpatients at San Jose from 1974-1976. He and Gloria divorced and moved to New Mexico where he devoted his time to young children and troubled teens both at St Vincent’s Hospital and his private Practice. In 1992, he moved to Bowling Green, Kentucky as Medical Director of a Psychiatric Hospital. Farmington, New Mexico, Bowling Green again ‘till 1996, he decided to move around and work as a locum tenens. Discovering he suffered from Parkinson’s Disease, his working life was over. Battling its cruel symptoms, he took up watercolor painting, and traveled far and wide, keeping on the move and cheerful till the last. Meeting his wife at the Galisteo Rodeo in 1984, their relationship and later marriage spanned nearly thirty-five years. 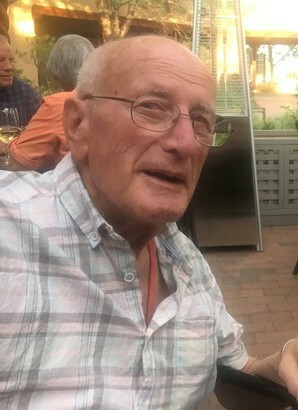 David passed away on peacefully at his Galisteo home on September 13th, 2018. He is survived by his wife, Elizabeth Rose, his daughter, Katherine Ellis, son Eli Burk, and grandchildren Lillian and Landry, as well as by his adopted family; stepsons, Miles and Anthony Jefferson, and grandchildren, Jake, Amelia and Alfie. A warm and lovely man, he will be missed, alike by his ex-patients, colleagues, friends and family. In lieu of flowers donations can be sent to the New Mexico Parkinson Coalition, www.nmparkinsons.org and you can support this cause by designating NM Parkinsons Coalition as your Amazon SMILE charity of choice (a percentage of your amazon purchases will be donated at no cost to you) .